The housing market is back! 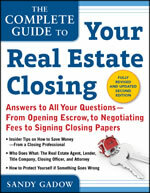 This new edition brings homebuyers and sellers up to date on everything they need to know for a smooth transaction. Armed with The Complete Guide to Your Real Estate Closing, buyers and sellers will glide through a process that can trip up even the most experienced professionals. The book explains basic concepts in easy-to-understand terms, showing concrete ways to avoid common pitfalls. It also provides tips and ideas for seasoned buyers and sellers. This revised and updated second edition is currently available in Kindle eBook format and Nook eBook format. You can still read this valuable resource even if you don’t own a Kindle, iPad or other device. Amazon offers several Kindle free reading apps that allow you to download and read Kindle eBooks on your computer, tablet, or cell phone. Barnes & Noble aslo has Nook free reading apps.